Loretta has been empowering and motivating individuals to realize their potential for more than 30 years. As a certified retirement coach, her focus is on the non-financial aspects of retirement planning that are an essential part of a successful retirement. 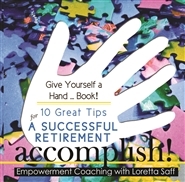 Loretta helps people embrace, enjoy and thrive as they make the transition to their next 20 years! Her 10 Great Tips Handbooks build confidence and help inspire people to handle life’s challenges. A simple handbook for that happy/tricky time when your kids have kids! 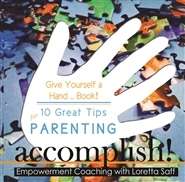 Loretta Saff has been empowering and motivating individuals to realize their potential for more than 30 years. Her 10 Great Tips Handbooks build confidence and help inspire people to handle life's challenges. Loretta has been empowering and motivating individuals to realize their potential for more than 30 years. In the field of gifted education she worked with parents, teachers, students, and administrators, helping them find comfortable ways to interact and function in new situations and challenges. 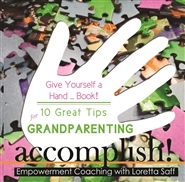 Her "10 Great Tips" Handbooks build confidence and help inspire people to handle life's challenges. 10 Great Tips for PARENTING - a simple handbook for one of the hardest - yet most rewarding - work there is. 10 Great Tips for Parenting. A simple handbook for one of the hardest - yet most rewarding - work there is ... PARENTING! Loretta Saff, M.A., CPC has been empowering and motivating individuals to realize their potentioal for more than 30 years. In the field of gifted education she worked with parents, teachers, students, and administrators, helping them find comfortable ways to interact and function in new situations and challenges. Her 10 Great Tips Handbooks build confidence and help inspire people to handle life's challenges. Life's a puzzle, and sometimes we just need a little help putting the pieces together.